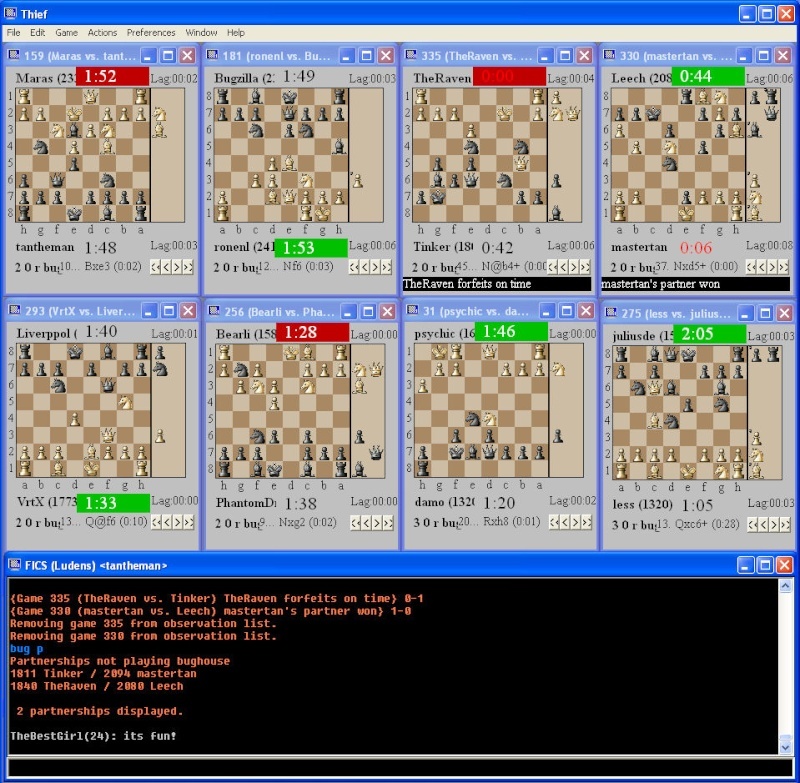 Thief is a free chess client written by Zon Jan to play on chess servers like the Free Internet Chess Server (FICS). Thief can be customized and supports regular chess and all variants like bughouse, crazyhouse, Losers, Suicide, Kriegspiel and others. It is the the preferred client of Bughouse Players. Bughouse is a special team-chess game (for more information on Bughouse see http://www.bughouse.net). Thief works in Windows 95/98/NT/2000/XP/Vista/7 and also in WINE. 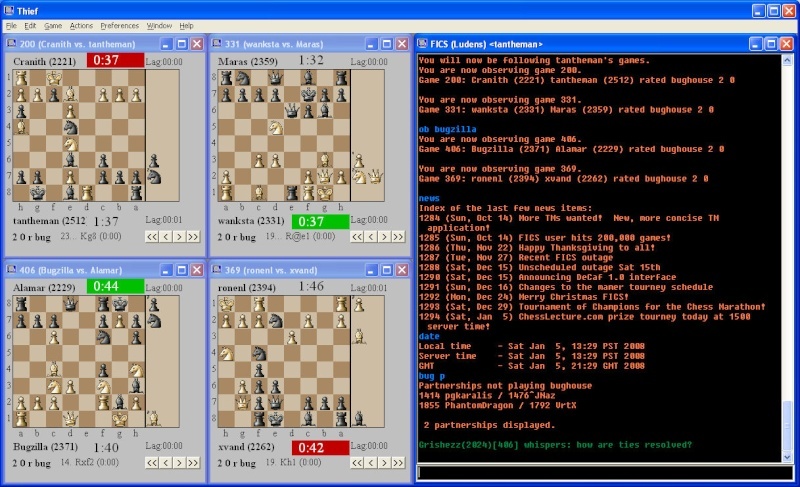 - New Layout for "Window -> Try Window layout": "Observe eight games"
- Bughouse Clocks can show which teams are up/down on time ("Preferences -> Game Configuration -> Clock Display -> Colored Bughouse Clocks"), colors are configurable in "Preferences -> Game Configuration -> Board Appearance"
- Win XP/Vista/7 conformity: Folder BUGSTUFF and all folders/files requiring write access are now located in subfolder THIEF of user document folder. See the changelog for a complete list. You can find the sourceforge project page here. 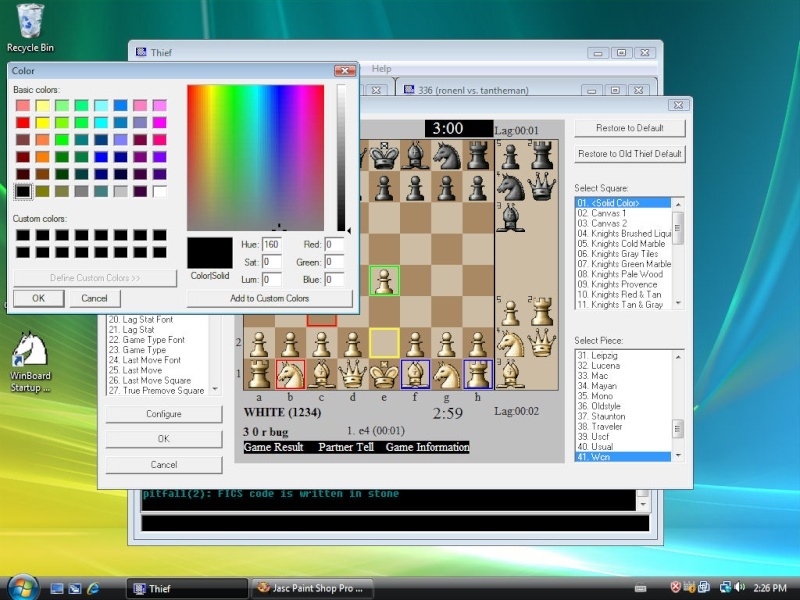 new: New Layout for "Window -> Try Window layout": "Observe eight games"
Colored Bughouse Clocks ("Preferences -> Game Configuration -> Game Options -> Colored Bughouse Clocks"), colors are configurable in "Preferences -> Game Configuration -> Board Appearance"
Exit prompt on active ICS connection is now configurable in "Preferences -> No Exit Prompt when connected"
The installer requires administrator rights. Thief itself runs with normal user rights. If you install it from a normal user (=non-admin) accout you have to do one additional step: move the subfolder THIEF from the installing administrator's "My Documents" folder to the user's "My Documents" folder after the installation has completed. To use the female voice pack just download and unzip it into the "My Documents\Thief\Wave" subfolder.